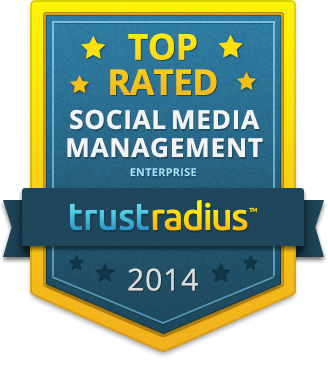 Austin, Texas, January 28th, 2015 - TrustRadius, the leading community for professionals to share candid insights about business software, today announced the release of its TrustMap™ for Enterprise Social Media Management software, which ranks products based on end-user “likelihood to recommend” ratings and frequency of evaluation by enterprises. Unveiled in TrustRadius’ new Buyer’s Guide to Enterprise Social Media Management Software, the TrustMap™ helps software buyers quickly locate the products most highly rated and evaluated by their peers. The Buyer’s Guide includes a detailed review of products by use case, and a distillation of 400+ authenticated end-user reviews across 23 social media management products used within enterprises. Because social media management software requirements vary depending on use case, the guide explores the three major ways enterprises are leveraging social media: customer care, social intelligence and marketing, along with the software features and products that support them. The guide also includes in-depth cases studies of how Comcast, British Telecommunications and Groupon are using social media management software for enterprise-level social media programs. Austin Texas, Dec 9th, 2014 - TrustRadius, the leading community for professionals to share candid insights about business software, today announced the release of its TrustMaps™ for Business Intelligence software, which rank products based on user ratings and evaluation frequency within two distinct segments: Full-Stack and Data Discovery & Visualization. Unveiled in its first Buyer’s Guide to Business Intelligence Software, the TrustMaps™ quickly help software buyers locate the solutions most highly rated and adopted by their direct peer group and therefore most closely aligned to their needs. 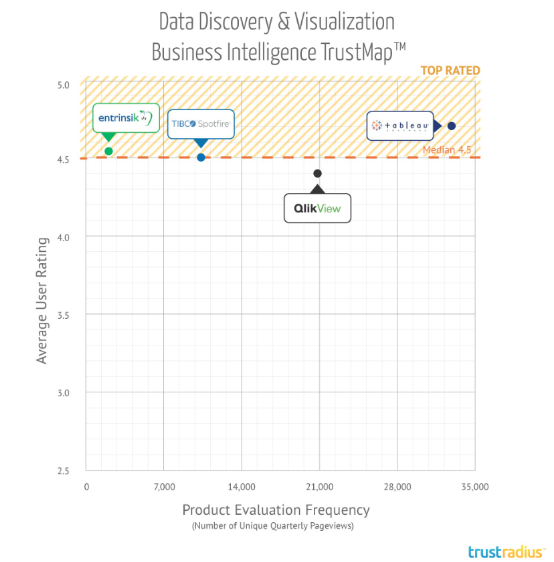 Each TrustMap™ depicts BI products on two dimensions – likelihood to recommend ratings by users and the product evaluation frequency on TrustRadius, as measured by unique page views. All 530 in-depth reviews and ratings come from authenticated users of BI tools on TrustRadius.com. Because success is not solely contingent on software selection, the guide includes a discussion of key factors for achieving success with BI software, drawn from interviews with highly regarded independent BI experts. Dr. Barry Devlin, Principal, 9sight Consulting agrees: "Evaluating BI products is always a challenge, given their number and variety. Qualified user reviews and perspectives, such as those offered by TrustRadius in its Buyer's Guide, provide a highly useful and independent approach to narrowing the choices available and understanding where to probe particular vendors." SiSense is somewhat different from the other tools; it might best be considered a full-stack ‘big data’ product since it has been designed to handle large volumes of data efficiently and quickly. Pentaho and Jaspersoft, two open source BI tools are also rated highly. Tableau stands out as the highest rated product in this category, but all of these products are very highly rated and the differences between the user ratings are nominal. The popular product, Qlikview is also highly rated, but fell below the median rating for the Data Discovery and Visualization segment, which in aggregate achieves higher user ratings than the Full Stack segment. An estimated $14 billion is spent on business intelligence (BI) software each year. Unique page views for BI products – a measure for how many people are running evaluations – grew 16 percent from Q2 to Q3 on TrustRadius. 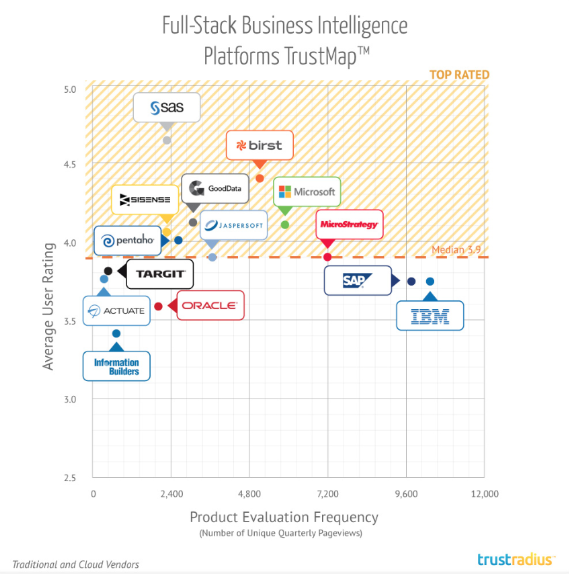 The most evaluated BI product on TrustRadius in Q3 was Tableau, followed by Qlikview. The next most evaluated products were IBM Cognos, Tibco Spotfire, and SAP Business Objects. This story is based on an interview with TrustRadius member, Al Schoneman. Al is Director of Marketing at Power Analytics Corporation. He joined TrustRadius a year ago and wrote an in-depth review of WordPress and Pardot. Al Schoneman is the marketing director at Power Analytics Corporation, a company that creates, markets and supports software used to design and develop power systems. However, Al was struggling earlier this year to pinpoint the right software combination for Power Analytics' needs. 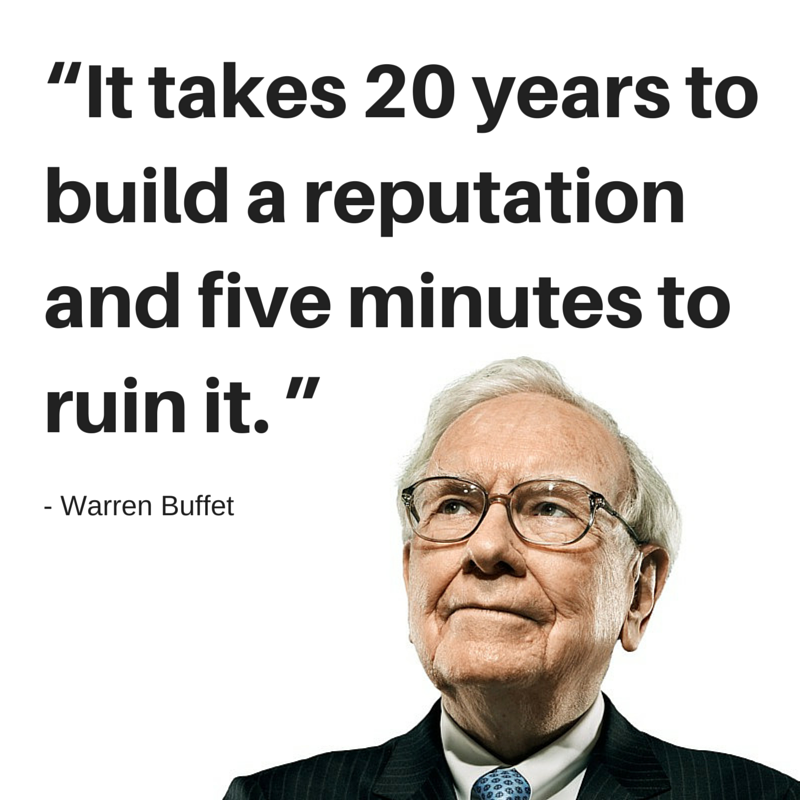 "I had some real frustration evaluating marketing automation solutions," Al said. "We were looking at some pretty big development costs to integrate our marketing automation with our CRM system." Al is active in LinkedIn groups for marketers and also in several software user groups. A member of one pointed him toward TrustRadius to source a more objective and comprehensive overview of the products he was considering. The company had just begun to use Pardot for marketing automation, and Al's boss strongly believed they should stick with their current CRM, Oracle, because he thought it worked better with their finance software and other packages. Through TrustRadius reviews, Al learned that probably wasn't quite right. "The fact that the reviews are user written made the content invaluable to us," he said. "I couldn't find anyone on TrustRadius who had used Oracle CRM with much of anything else." When Al finished his analysis, Power Analytics wound up migrating to Salesforce, a choice that proved better suited to the size and scope of their business. Last month we published our first ever Buyer's Guide to A/B Testing Software, which ranked and explored the strengths and weaknesses of several A/B testing software products, based on end-user reviews on TrustRadius. We're following up with another useful tool for companies looking to choose the right A/B testing software: A feature comparison chart, which you can download here. Salesforce announced its entry into Business Intelligence (BI) software market at Dreamforce in October with the launch of Salesforce Analytics Cloud, also known as Salesforce Wave. At TrustRadius, we pride ourselves on sharing the end-user perspective. In the case of Wave, it’s been impossible to track down any beta users, so we’re offering our own perspectives and those of market participants we interviewed. A/B Testing is an emerging but rapidly growing software category. Our August 2014 Conversion Rate Optimization Survey, indicated that 48 percent of companies plan to spend more on A/B testing tools this coming year. It has also attracted a fair amount of investment capital. Optimizely has raised $88 million including a $57 million round this May. Monetate has raised $46 million, and Maxymiser has raised $15m. A/B Testing software is also a rapidly growing category on TrustRadius. Page views for A/B Testing software products – a measure for how many people are running evaluations – grew 30 percent from Q2 to Q3.